SDI Video Input : 1 x 12 bit SD/HD switchable. Analog Video Input : 1 x Component YUV on 3 BNCs switchable to S-Video or Composite. HDMI Video Input : 1 x HDMI type A connector. SDI Audio Input : 2 Channels from embedded SDI audio. Analog Audio Input : 2 Channels of professional balanced analog audio with standard 1/4 inch jack connections. HDMI Audio Input : 2 Channels from embedded HDMI audio. Device Control : Sony compatible RS422 deck control port. HD Format Support : 720p50, 720p59.94, 720p60, 1080PsF23.98, 1080p23.98, 1080PsF24, 1080p24, 1080PsF25, 1080p25, 1080PsF29.97, 1080p29.97, 1080PsF30, 1080p30, 1080i50, 1080p50, 1080i59.94, 1080p59.94, 1080i60, and 1080p60. SD Format Support : 625/25 PAL, 525/29.97 NTSC and 480p. SDI Compliance : SMPTE 259M and 292. Multiple Rate support : SDI, HDMI and component analog video connections are switchable between standard definition and high definition. SDI switches between 270 Mb/s standard definition SDI, 1.5 Gb/s HD-SDI and 3 Gb/s HD-SDI. Audio Sampling : Television standard sample rate of 48 kHz and 24 bit. Copy Protection : For legal reasons HDMI input is unable to capture from copy protected HDMI sources. Always confirm copyright ownership before capture or distribution of content. 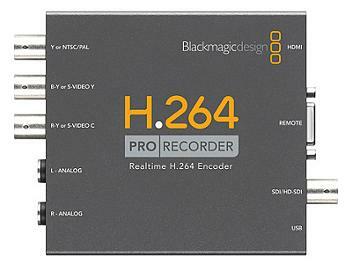 Encoding : Hardware based real time H.264 encoder supports multiple profiles for small, portable video devices through to full resolution HDTV. Realtime Scaling : Capture at full HD or SD resolution, or use direct resize in realtime to scale and encode for the intended playback device, such as iPhone, iPad or iPod. Realtime Cropping : Adjustable tools provide realtime cropping of unwanted video artifacts such as black borders and VHS switching. Firmware : Firmware upgrade via USB. Installation : Connect unit to the computer's USB 2.0 port, install Blackmagic H.264 Pro Recorder software and run Media Express.